E-way bill would be a masterstroke for today and times to come. E-way bill has to be generated before the shipment starts its journey. This will establish a direct correlation between what is declared and what is actually moved. On one hand, it will help the movement of goods without hassle between consignor and consignee. Here is the some questionnaire on e-way bill that will help us to analyse more on e-way bill. Why is the Eway bill required? Section 68 of the Goods and Services Tax Act mandates that the Government may require the person in charge of a conveyance carrying any consignment of goods of value exceeding such amount as may be specified to carry with him such documents and such devices as may be prescribed. Rule 138 of Karnataka Goods and Services Tax Rules, 2017 prescribes e-way bill as the document to be carried for the consignment of goods of value more than rupees fifty thousand. Government has issued a notification under rule 138 of Goods and Services Tax Rules, 2017 mandating to carry e-way bill for transportation of goods of consignment of value more than rupees fifty thousand. Hence e-way bill generated from the common portal is required to be carried. Who all can generate E-way bill? Every registered person who causes movement of goods of consignment value exceeding fifty thousand rupees in relation to supply; or reasons other than supply; or inward supply from unregistered person shall generate e-way bill. The unregistered transporter can enroll on the common portal and generate the e-way bill for movement of goods for his clients. Any person can also enroll and generate the e-way bill for movement of goods for his/her own use. What are the pre- requisites to generate e-way bill? To generate the e-way bill, it is essential that the person shall be registered person and if the transporter is not registered person it is mandatory to get enrolled on the common portal of e-waybill (http://ewaybill.nic.in) before generation of the e-way bill. Part-A Slip is a temporary number generated sfter entering all the details in PART-A . This can be shared or used by transporter or yourself later to enter the PART-B and generate the E-way Bill. This will be useful, when you have prepared invoice relating to your business transaction, but don’t have the transportation details. You can enter invoice details and keep it ready for transportation, once the transportation is ready. If the consigner or consignee is unregistered taxpayer and not having GSTIN, then user has to enter ‘URP’ [Unregistered Person] in corresponding GSTIN column. 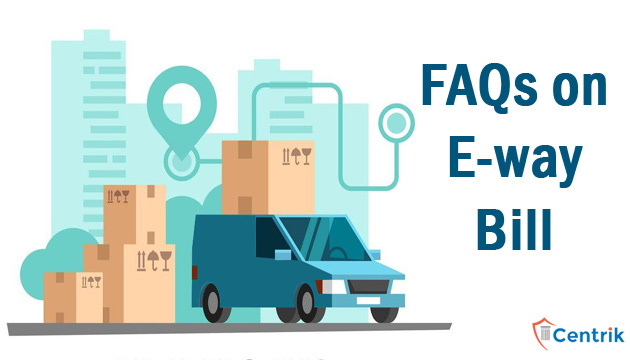 Any person can verify the authenticity or the correctness of e-way bill by entering EWB No, EWB Date, Generator ID and Doc No in the search option of EWB Portal (http://ewaybill.nic.in). If multiple invoices are issued by the supplier to recipient, that is, for movement of goods of more than one invoice of same consignor and consignee, multiple EWBs have to be generated. That is, for each invoice, one EWB has to be generated, irrespective of same or different consignors or consignees are involved. Multiple invoices cannot be clubbed to generate one EWB. However after generating all these EWBs, one Consolidated EWB can be prepared for transportation purpose, if they are going in one vehicle. Henceforth, it’s a good step taken by government as a key to plugging revenue leaks. And at the same time exemption for goods valued below Rs 50,000/- was introduced to help the small Companies.